December 26, 2017, when jointly meeting the press with Foreign Minister Salahuddin Rabbani of Afghanistan and Foreign Minister Khawaja Muhammad Asif of Pakistan, Foreign Minister Wang Yi expressed that China and Pakistan are willing to, together with Afghanistan, actively discuss extending the China-Pakistan Economic Corridor (CPEC) to Afghanistan in a proper manner under the principle of mutual benefit and win-win results. China-Afghanistan-Pakistan Foreign Ministers’ Dialogue aims to enhance political mutual trust through this platform, eventually, to jointly deal with development and security challenges in the region. In view of bilateral relations, Beijing regards Afghanistan as a key land-corridor of building the “BRI”, and determines to, together with the Afghan side, enhance the docking of development strategies. Accordingly, China adheres to the principle of the “Afghan-led and Afghan-owned”, that means “leaving Afghanistan to realize its broad and inclusive political reconciliation at an early date.” In response, Afghan FM Salahuddin Rabbani regards China as a permanent and reliable partner. Since Beijing has provided precious aid and support for Afghanistan in various fields, Afghanistan stands ready to actively participate in the “BRI” proposed by China. He then added, China is a mutual friend of Afghanistan and Pakistan as well, Afghanistan appreciates the efforts made by China to advance the improvement of relations between Afghanistan and Pakistan. Likewise, Pakistan FM Asif appreciates China’s proposition of holding the China-Afghanistan-Pakistan Foreign Ministers’ Dialogue in light of the guidelines for promoting harmony and friendship among the three sides. At the conclusion of their first tripartite meeting, eight major consensus were reached, which include political mutual trust and reconciliation, development cooperation and connectivity, and security cooperation and counter-terrorism as three main topics to actively push forward trilateral cooperation in line with the principles of mutual respect, equal consultation, mutual benefit and win-win results. 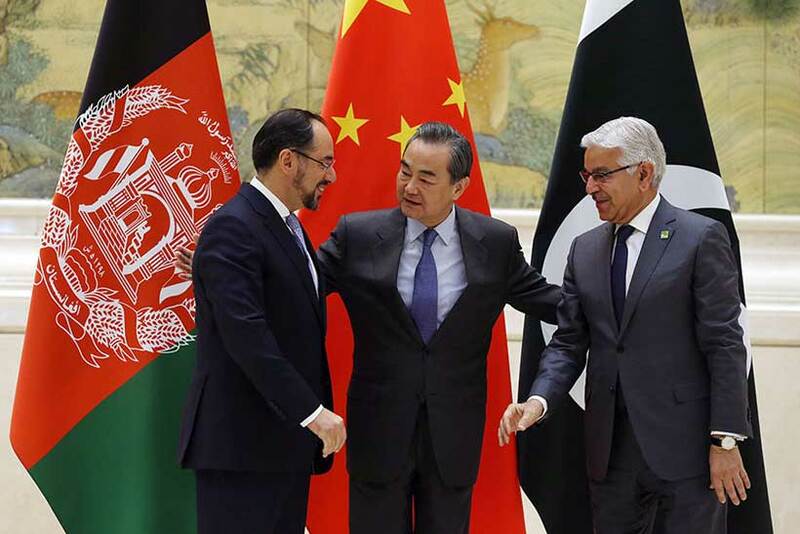 China promises that the tripartite sides commit themselves to realizing the following four goals: supporting Afghanistan’s peaceful reconstruction and reconciliation process, helping Afghanistan and Pakistan to improve and develop relations, promoting common security in the three countries and the region, as well as pushing forward regional connectivity and international cooperation under the Belt and Road Initiative. China supports the Afghan government in carrying out peace talks with the Taliban, and will continuously offer convenience to this end. Nonetheless, when the news was released, it immediately aroused two concerns: what will India respond to this proposalsince it has suspected China and Pakistan geopolitically; and how the presence of US permanent military bases in Afghanistan and thefragile security situation of Afghanistan allows the successful realization of this scheme? The following inquiry is where China would be able to move towards along with its two neighboring countries. As a strategically important neighbor of China and Pakistan, Afghanistan has an urgent desire to develop its economy and improve people’s livelihood, and it is willing to integrate itself into the process of regional connectivity. China stand ready to discuss extending the CPEC to Afghanistan in a proper manner under the principle of mutual benefit and win-win results not only to help Afghanistan develop its economy and people’s livelihood but also to gradually connect CPEC with the China-Central Asia-West Asia Economic Corridor through Afghanistan in the long run. Through, the Three parties have shown willingness to jointly promote more extensive connectivity under the framework of the “Belt & Road Initiative” with a view to make feasible contributions to development and prosperity of the region. True, it is still difficult to predicate the results.Security is possibly the most important challenge to CPEC’s successthus, unless peace is restored in Afghanistanit hard to imagine the successful development of this vital initiative. Afghanistan security: A volatile Afghanistan and the worsen Pak-Afghan relation is not only not in the interest of China but no more tolerable for the rise of China.Thus, China through the 1st China, Afghanistan and Pakistan tripartite ministerial dialogue can best be described as an honest broker in the bilateral relationship between Afghanistan and Pakistan and ostensibly the possible solution for ending the decades long Afghan security turmoil. Pakistan, all along meddled in Afghanistan and continue to do so to gain what is often termed the ‘Strategic Depth’. This is to secure their own backyard by keeping off anti-Pakistan forces especially India out of Afghanistan and to block any pro-Indian regime in Kabul and ensure a pro-Pakistan regime in control of Kabul in order not to be encircled by enemies from two sides. Since then Pakistan is supporting various militant groups in Afghanistan to represent their interest. The rise of Taliban was in part of direct support from ISI of Pakistan. ISI interest with the Taliban was determined predominantly not out of a common Islamic ideology but slightly on ISI’s intentions that it need to sustain influence in Afghanistan to develop strategic depth. Thus, the post-Taliban armed-conflict and revival of Taliban as insurgent group is due to Pakistan’s hazardous double game. It has in the process destabilized Afghanistan beyond any easy recovery and created huge problems for itself as reflected in the worsening internal security of Pakistan. India continues to have significant influence in Afghanistan and Pakistan is burning more resources than possibly it should be.Therefore, it is expected that, China that has historically maintained good and friendly relations with Afghanistan, at the same time has good influence on Pakistan, can persuade Pakistan to stop meddling in Afghanistan and leave its policy of gaining strategic depth in Afghanistan. Bringing an end to Pakistan’s proxy warfare is necessary for the stability of Afghanistan. Peace and stability in Afghanistan would bring success to the implementation of such vital initiatives as CPEC. Economically Pakistan could enormously gain from the reconstruction process of Afghanistan and would be able to reintegrate itself into the resource rich Central Asian republics by offering its shortest route to the sea. India may maintain its hostility indefinitely but with much less influence. U.S. permanent military bases: US permanent militarily bases at the backyard of rising China, also Russia and Iran, are the other barrier for the success ofthis initiative. On October the 7th 2001 US waged war on Afghanistan not only to chase away the Taliban and the Al-Qaida whom they considered the attackers of 9/11, they came to Afghanistan in the name of liberating the nation out of the misery and devastation it was in due to the Taliban regime. Nevertheless, time proved, it was all propaganda and their just war had little except their need to have a say on this piece of strategic geography. The US invasion on Afghanistan and its involvement in Afghan armed-conflict is less concerned about countering terrorism but rather its more about US national interest in securing permanent military bases in this strategic piece of land to dominate the entire region such as Middle East, Persian Gulf, Central Asia, and/or to make sure that nobody else dominates this region and do not allow any pair competitor to be arise in the region. For the rising China when the permanent US military bases comes into play it can/is pose [ing] a threat to its national security interest and jeopardize its very survival. Thus, it is essential that China must be clearly aware of what is happening in its backyard. China and all the regional countries needs to work together and makea well detailed proposal with a defined timetable for the withdrawalof US and all other foreign troops from Afghanistan at the earliest which is essential for the peace of Afghanistan and the region.